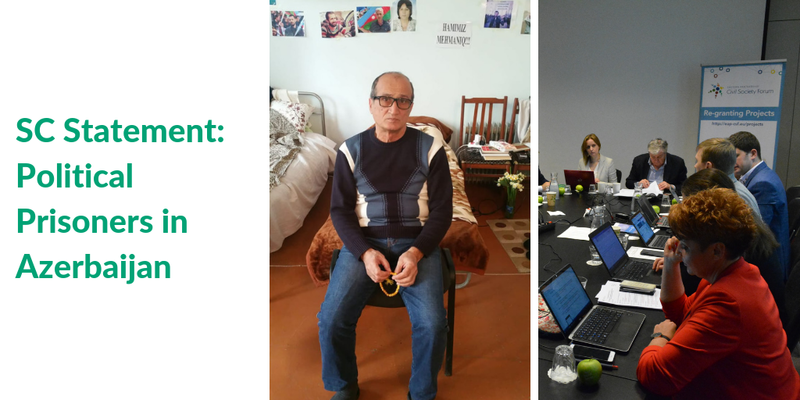 While meeting in Brussels on 7 February 2019, Eastern Partnership Civil Society Forum (EaP CSF) Steering Committee adopted a statement on the political prisoners in Azerbaijan – coinciding with the EU-Azerbaijan Human Rights Dialogue, happening this week in Baku, the country’s capital. Reports of torture, and the number of political prisoners held by the regime – which is thought to be over a hundred, undermine Azerbaijan’s credibility and its “commitment to human rights”. The statement also comes after the campaign to free Mehman Huseynov, Azerbaijani blogger, threatened with fresh criminal charges – presented to him shortly before his release date. Huseynov is now due to leave prison with no additional charges, but the case has mobilised crowds on the streets of Baku on 26 January 2019, on a scale unseen since the protests in 2013. The case helped to highlight the situation of political prisoners in Azerbaijan, and attracted the attention of the European Parliament and Council of Europe, among other international actors. The pressure on the authorities in Azerbaijan must be maintained – claims the Steering Committee, and urges the EU and its member states to go further. “Consider the imposition of sanctions against those responsible for torture in prisons”, we read. Political prisoners, such as Tale Bagirzada, Jabbar Jabbarli and Abbas Huseyn from the Muslim Union Movement or Babek Hasanov, Agil Maharramli, Ruslan Nasirli, Saleh Rustamli and Vidadi Rustamli from the Azerbaijani People Front Party, represent only a fraction of those who have claimed to be tortured while in prison, warns the Steering Committee. Some have initiated a hunger strike in protest of their continued detention – to bring attention to what is, unfortunately, a recurring problem in Azerbaijan.